I am not a fan of fish. I know how good it is for me. I know I should be feeding it to my family. So I try. But honestly, fish isn't my thing. Which is why I'm constantly looking for ways to dress it up. Often I'll roast the fish plain and then throw together a quick mayonnaise-based sauce, like this lime sorrel sauce. But last night, faced with a container of fresh farmed tilapia from Costco and only half an hour until we all fainted from hunger, I decided to try something different. I went with the flavors of southern France. I spread the filets on a foil-lined baking sheet and spooned over some oven-roasted tomatoes I'd put up a few weeks ago. I scattered marinated artichoke hearts and green olives over the top, squeezed some lemon juice over it all, and baked it in a hot oven for about 20 minutes. The fish was flaky and tender, the tomatoes melted and coated the filets, and the juices from the lemon, artichokes and olives kept the whole thing moist. Even I liked it! Mild, white tilapia with the flavors of sunny southern France - a quick weeknight fish dish everyone will love. Serve with rice or couscous to catch all the juices. Preheat the oven to 400 degrees.Line a sheet pan with foil. Lay the tilapia filets on the pan in a single layer. 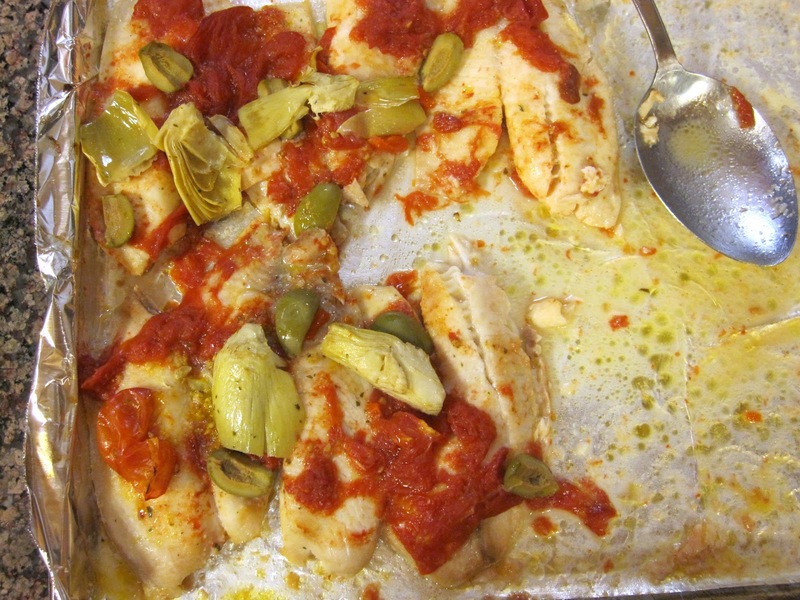 Scatter the tomatoes, artichoke hearts and olives on top of the fish. Squeeze the lemon juice over the top, season with salt and pepper, and drizzle the olive oil over the whole thing.Bake the tilapia about 20 minutes, until the fish is flaky and the vegetables are starting to melt. Do not overcook or the fish will be dry. Serve with rice or couscous. I'm not huge on fish either, but I love all the flavors incorporated in this dish; I might have to give it a try. I am totally impressed that you pulled this together "last minute." Beautiful flavors!